SCVHistory.com MU8491 | William S. Hart Museum | Hart Entertains Aviatrix Amelia Earhart at His Newhall Estate. Actor William S. Hart (1864-1946) entertains aviatrix Amelia Earhart (1897 - disappeared 1937) at his Newhall estate. Original print on display at the William S. Hart Museum in Newhall. Four prints of this same photograph reside in the Purdue University Libraries archive, which houses the Amelia Earhart Papers. 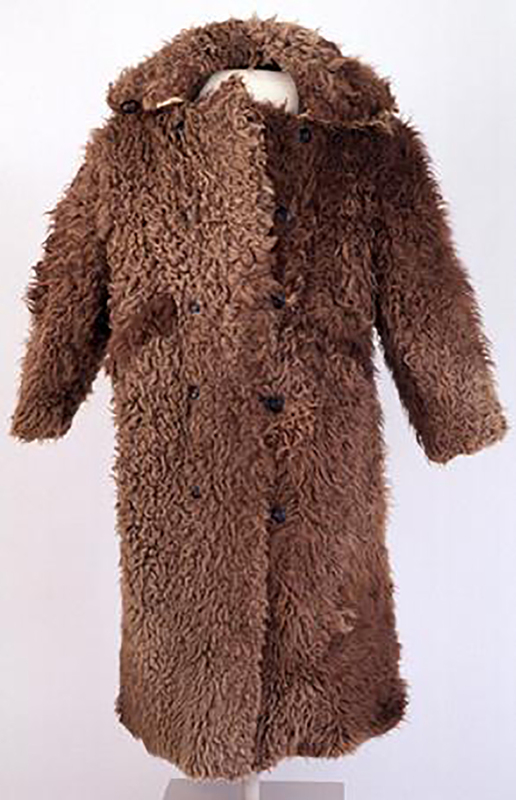 They were given to Purdue after Earhart's disappearance by her widower, George Palmer Putnam. One print (see below) is inscribed: "Dot / With all my Love, Amelia." 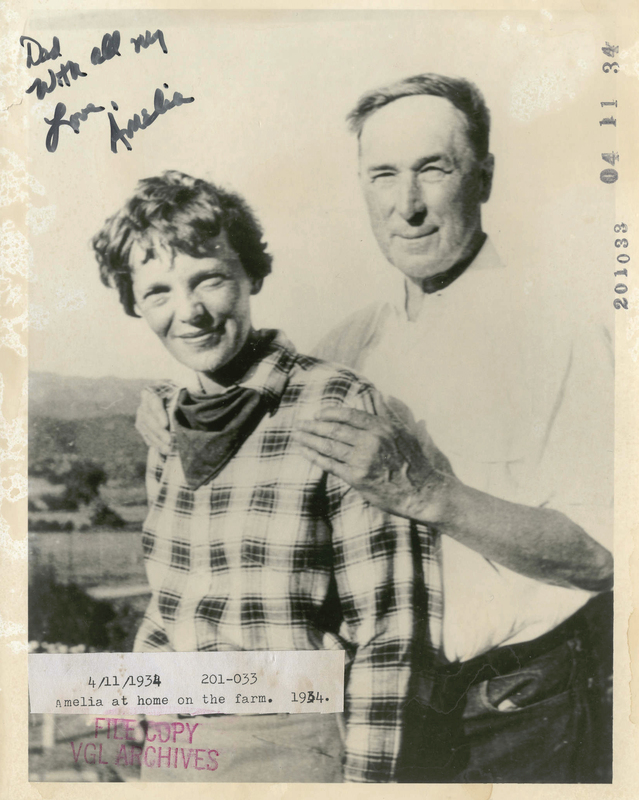 The print is date-stamped 04-11-1934 and bears the typewritten notation, "4/11/1934 201-033 / Amelia at home on the farm. 1934." "Dot" would be Dot Leh, a friend of Earhart with whom she was in communication in early 1934. We don't know if this photograph represents the first time Hart and Earhart met, although it is likely, based on a lack of any evidence that they knew each other previously, weighed against a modest wealth of evidence afterward. During the spring and summer of 1934, Earhart was trying out a new airplane engine, and she exchanged one Lockheed Vega for another. Putnam, her husband and business manager, hired Paul Mantz to oversee the overhaul at Lockheed's Burbank plant. Putnam wrote in 1939: "Paul Mantz had borrowed AE's Lockheed Vega one day, and in the course of a landing and the Newhall field had flown lower than he should over Bill's home." Annoyed, Hart tracked down the plane's owner from the tail number — and a friendship was born. Unfortunately, Putnam doesn't provide the date or even the year of the incident, and apparently the news of Earhart's visits to Hart's Newhall home did not make any newspaper. 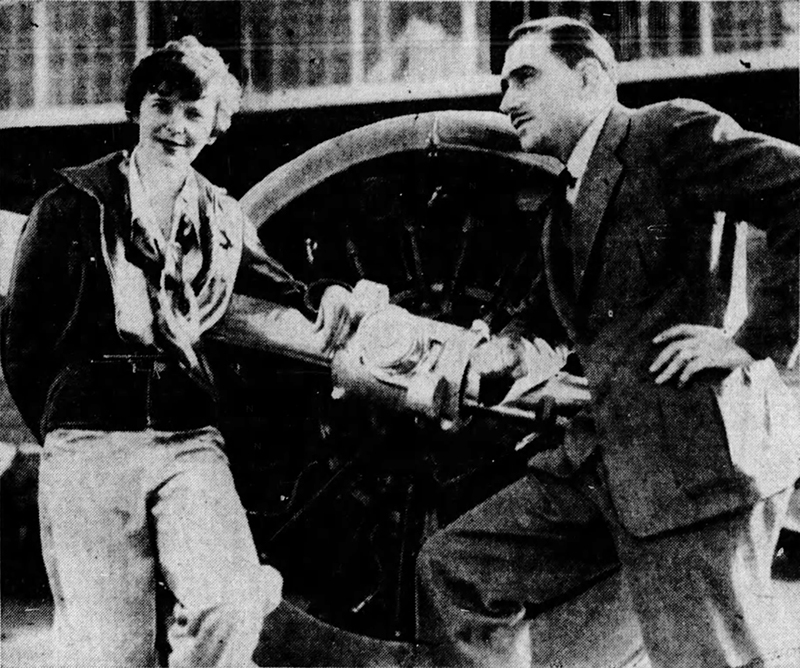 Putnam had met Mantz when the latter was working on the 1927 blockbuster film, "Wings." Putnam had sold the story to Jesse Lasky at Paramount. 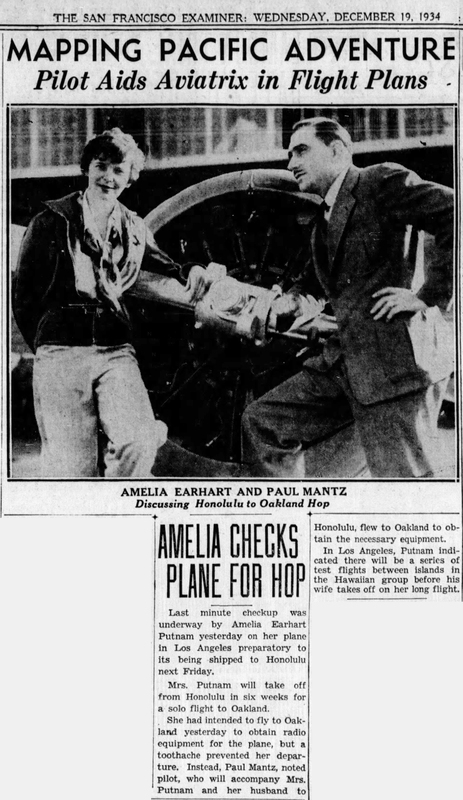 Precisely when Putnam introduced Earhart to him is unknown, although by 1934, when she was planning her flight from Honolulu to Oakland, Mantz "had long been AE's technical adviser." Certainly she knoew him in 1932 when he gave flying lessons to Putnam's son from his previous marriage, David Binney Putnam. Earhart and Mantz would eventually become business partners. Earhart and Mantz in 1934. Click for news article. 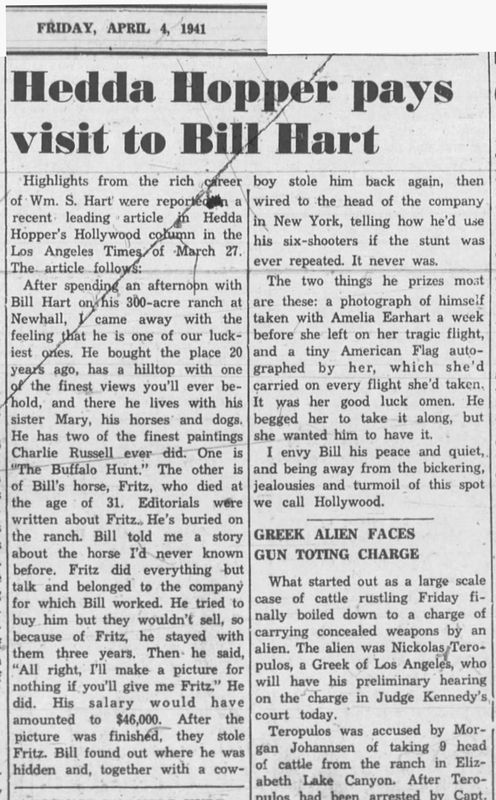 Years later, in March 1941, columnist Hedda Hopper visited Hart at his Newhall home and wrote: "The two things he prizes most are these: a photograph of himself taken with Amelia Earhart a week before she left on her tragic flight, and a tiny American Flag autographed by her, which she'd carried on every flight she'd taken. It was her good luck omen. He begged her to take it along, but she wanted him to have it." The flag is a possibility. 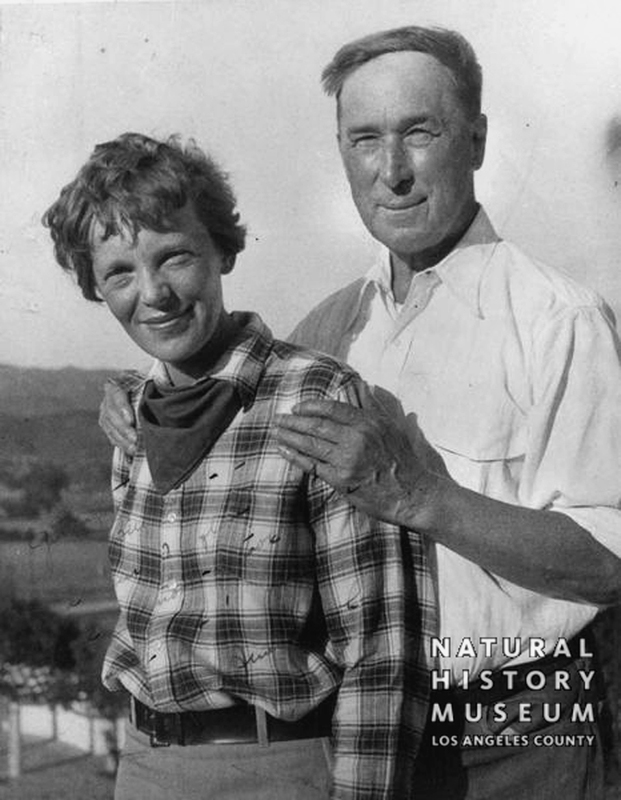 Putnam and Earhart were living in North Hollywood in 1937, and she was in the Los Angeles area. Earhart departed from Burbank May 21, 1937, destination Miami, for the first leg of her circumnavigational flight. But the best evidence, the date stamp on the print at Purdue, points to 1934 for the photograph. 1. Lovell, Mary S. "The Sound of Wings: The Life of Amelia Earhart." New York: St. Martin's Griffin, 1989, pg. 204. It can't say "Dad;" he died in 1930. 3. Putnam, George Palmer. "Soaring Wings: A Biography of Amelia Earhart." New York: Harcourt Brace, 1939; Manor Books 1972 edition, pp. 234-236. 5. See Los Angeles Times, July 12, 1932. 6. As published in The Newhall Signal and Saugus Enterprise, April 4, 1941. It doesn't say "Dad;" he died in 1930. It says "Dot." Click image to enlarge. MU8491: Natural History Museum of Los Angeles County's Seaver Center for Western History Research, Catalog No. GPF-8491.